The Hilton Niagara Falls is the closest hotel to the Fallsview Casino Resort, and is directly connected through an enclosed walkway. Niagara Falls is a first-class destination and the Hilton Niagara Falls offers world-class accommodations. 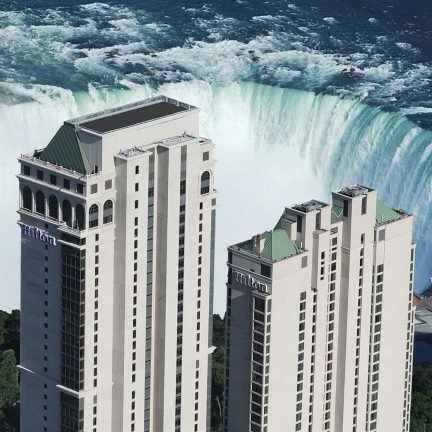 Hilton Niagara Falls – Fallsview Hotel & Suites is comprised of a 34 storey luxury Fallsview hotel featuring spectacular Jacuzzi and two room family suites, a rooftop Fallsview restaurant and “Experience the Falls” Adventure Pool. The hotel also includes a second tower, the tallest hotel in Canada, standing at 58-storeys and featuring 464 guestrooms. This Niagara Falls Hotel offers exceptional hotel amenities, fabulous views from their guestrooms, Fallsview fine-dining, and much more. The Hilton Niagara Falls Fallsview offers spectacular Fallsview amenities including accommodations and dining. The Hilton offers a view of both the American and Horseshoe Falls and is located in the Fallsview District of Niagara Falls. 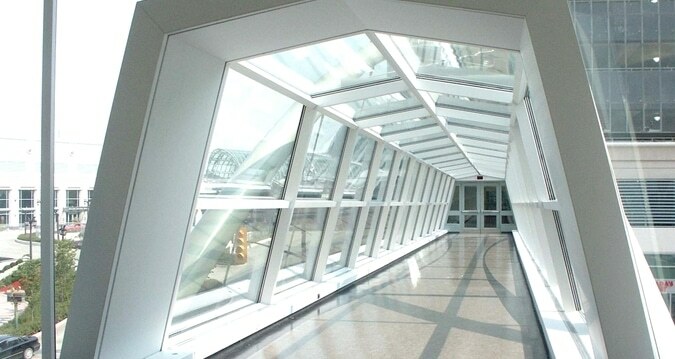 This 4 Diamond hotel offers direct indoor connections to Niagara’s newest casino, the Fallsview Casino Resort via the glass enclosed walkway. Hotel accommodations for the Hilton hotel are perfect to fit your vacation needs. The Hilton Niagara Falls Fallsview Hotel guest rooms feature a classic resort decore with single Whirlpools and 2 person Jacuzzis in over 80 percent of the rooms offered at this Niagara Falls Hotel. For the family vacation the Hilton offers a 2 room family suite and for a more romantic Niagara Falls getaway the Jacuzzi suites are offered. Located on floors 33 and 34, the Watermark Restaurant is a one-of-a-kind rooftop restaurant that will inspire you with its view and appetizing menu. Water theme design and decorum complete with two aquariums, 18ft windows, vaulted ceilings, wave entrance and soothing sounds is the best place to view the fireworks over the Falls! At the “Experience the Falls Adventure Pool” dip into the 10,000 sq. ft. pool. 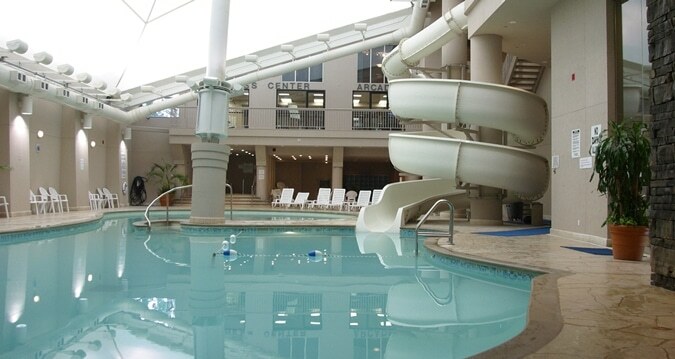 This indoor Waterpark is located on the 1st floor of the spectacular Hilton Niagara Falls. Take a slide down the 30-ft., three-story spiraling waterslide. Experience a spectacular 27ft cascading waterfall surrounded by 40 ft trees. Relax and unwind in the soothing sauna or steam room and let the day melt away..
All guestrooms include: two-line telephones with voice mail, data port, fresh air vent, hair dryer, iron and ironing board, alarm clock/radio, colour TV with pay per view movies, daily newspaper and in-room coffee. The Watermark Restaurant inspires with its view and appetizing menu. This one-of-a-kind rooftop restaurant will inspire awe and your appetite. Water theme design and decorum complete with two aquariums, 18ft windows, vault ceilings, wave entrance and soothing sounds. Best place to view the Fireworks over the Falls! Make your Dinner reservations at the Watermark! The Watermark features a wide assortment of breakfast buffet, lunch and dinner menus. Our special group tour menus offer delicious and affordable meals. With private dining areas and multi-level seating, we provide only the best dining experiencet. Or join us in our stunning cocktail lounge and enjoy refreshing beverages and appetizers. 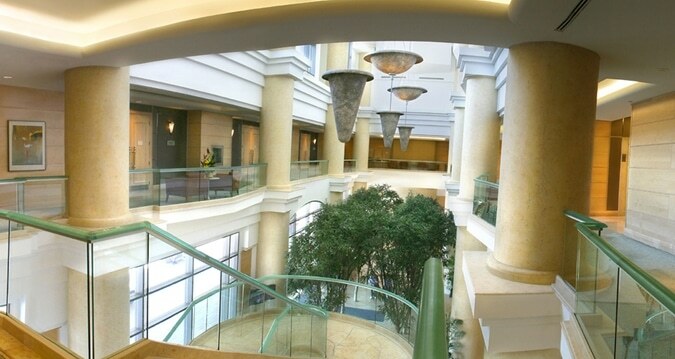 The Hilton Niagara Falls provides a sophisticated and contemporary meeting and convention facilities. From large corporate functions to small intimate meetings, our catering staff can handle executive board meetings or large formal banquets for group sizes ranging from 10 to 625. Our conference facilities offer 12,000 sq. ft. and expand to the second level overlooking the brilliantly decorated atrium and waterfall. The Hilton Niagara Falls has onsite AV services, complimentary hi-speed internet in meeting rooms, a full service conference team, on-site business centre, unobstructed views in conference rooms, conference food and beverage packages and one hour travel times to airports in Toronto or Buffalo.